She has had 2 litters. Litter One: to Vlasta Line Count 4 Kittens. Litter Two: to Prideshill Izzlexi Barron and we will repeat this mating soon. 5 Lovely kittens in the the second litter. We are repeating this mating soon. EXPECTING KITTENS From Vulcan a visting stud. Naantali is named after a place we visited in Finland. She is away being mated at the moment. News update to come. Odessa has been impressive on the show bench, always surprising the judges with her odd eyes one Blue and one Golden. Odessa has given us 3 litters. She likes to give us boys??? Her expected litter is a repeat mating from Count as they make the most wonderful Kittens! Izzy is our quiet girl, she is an excellent mother and the mother of Barron our Red Classic boy. 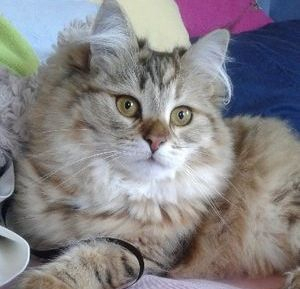 "Jelly" is our best Mom and deserves a huge cuddle for producing such wonderful kittens!! We adore her! Faina is our silver ghost! She is just settling in from her journey from Hungary. She is a beautiful girl and will be used in our Group 2 program. Ya Ya as we call her is just a baby and the daughter of Odessa and Count. 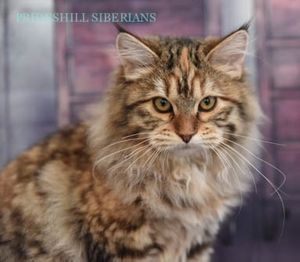 She will be with Prideshill for future litters. Her first litter will be with Barron. 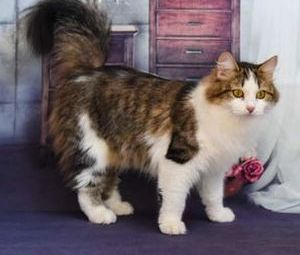 Missy is the long awaited daughter of one of our previous Queens. Thank you to Helen and Barry for having this litter for me. Missy shows great potential for our future. EXPECTING KTTENS with "Teafor". Chaynokty Tea for the Tillerman. Siri is still in Kitten class. 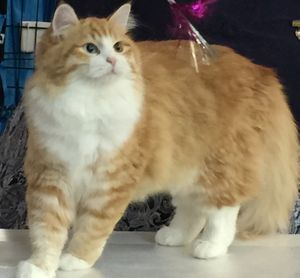 She has won a Supreme overall Longhair cat award and placed 4th in Show at the Brisbane Royal Show. She has a great future ahead of her.